There are so many seniors today that rely on different types of hearing aids in order to stay engaged and connected with the world around them. Since age related hearing loss, also known as presbycusis, is one of the most common ailments in the senior community, it is extremely important for all family members, loved ones and caregivers to have a basic understanding of proper hearing aid care, so that they can help their loved ones care for their hearing aids and keep them working properly. For most seniors with hearing loss, there is no cure for their condition. Hearing aids are the only real treatment that can help them. While hearing aids are extremely effective and important, they also require some ongoing care and maintenance. Here are a few tips on how seniors, caregivers and loved ones can help those with hearing aids maintain their devices and keep them working properly. Protect Hearing Aids From Excess Moisture– It is important to do what you can to prevent hearing aids from getting wet. This means removing them while showering, swimming, or bathing. If seniors tend to sweat frequently or are out in the rain, dry the area surrounding the hearing aid frequently. Store the Hearing Aids in the Right Place- Don’t store hearing aids in the bathroom, some of the most moisture-ridden rooms in the home. Instead store them at your loved one’s bedside and consider a dry hearing aid container for storage. Clean Hearing Aids Regularly- It is important that these hearing aids don’t get dirty. Clean them regularly with a dry cloth and wash hands before handling the aids. Always Be Ready with Batteries- Hearing aid batteries typically need to be changed every 1-2 weeks, so it is important to always have batteries nearby for when they run out. Listen for Whistling- If there is a whistling sound coming from the ear, it can mean that the hearing aid doesn’t fit correctly, that it isn’t positioned properly or that there is excess ear wax building up in the ear. Get Check Ups- Seniors with hearing aids should visit an audiologist every six months to have their hearing aids checked. During this time the tubing will also need to be replaced on the hearing aid, as they can dry out and crack over time. Consider a Dryer- If seniors regularly have moisture issues with their hearing aids, then it is important to invest in a dryer that can help remove this excess moisture. Don’t Let the Fall- Be careful when taking out or putting in hearing aids as dropping them may cause them to crack or break. This is the number one reason seniors have to get new hearing aids, so it is important that they are handled with care. 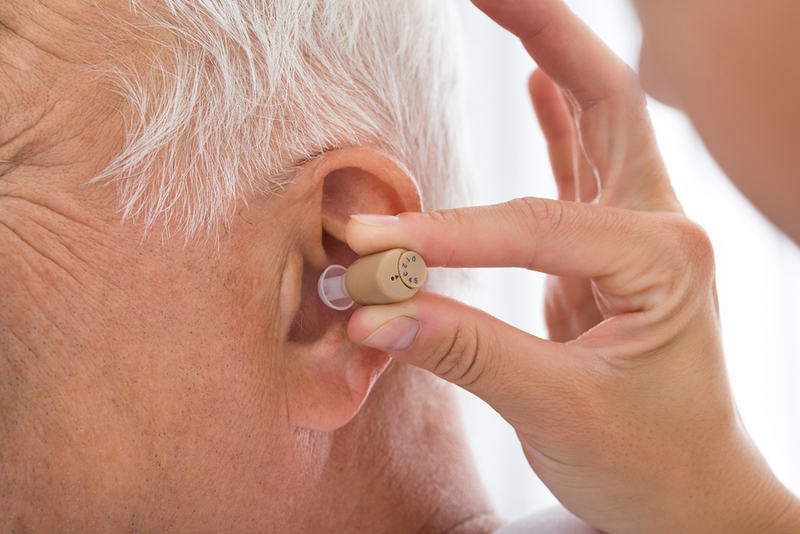 It is important to remember if there is ever a significant or ongoing issue with a hearing aid, the senior needs to visit their audiologist right away. They can help determine whether there is an issue with the device, your senior’s hearing or the way they are using their hearing aid, so seniors can continue to experience the best audio possible each and every day.